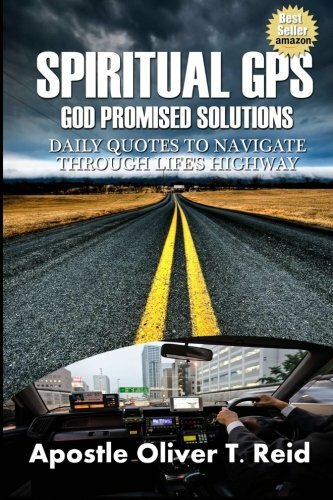 Spiritual GPS (GOD PROMISED SOLUTIONS) DAILY QUOTES TO NAVIGATE THROUGH LIFE&#x2019;S HIGHWAY Volume 1 Just like our daily commutes life's highway is filled with winding turns, unexpected delays, breakdowns, and unfortunately accidents. We can start off in our minds envisioning a well thought out plan to get us to our desired destination only to later find that road is closed or under construction. Oftentimes our fondest shortcuts lead us into major traffic jams. It is a proven fact that we map out our lives by identifying the familiar streets marking the crossroads that we are accustom to. You may be asking where I'm going with this and all I can say is stay along for the ride and keep your mental, emotional, and spiritual seat-belts fastened. Apostle Oliver T. Reid, called into the ministry in his youth, is a powerfully anointed and dynamic man of God. Known to be a remnant preacher and a testament to these times, Apostle Reid flows with a global prophetic mandate with God&#x2019;s signs and wonders following. A man of many gifts and talents, he walks in the office of Pastor, Prophet, Evangelist and Teacher, and most affectionately knows him as &#x201c;Apostle.&#x201d; As a trailblazer, stalwart, and international apostle Reid has a passion to see the body restored, sinner&#x2019;s saved, and broken hearts mended. Apostle Reid has served in numerous capacities, among them, Campus Minister at Winston Salem State University from 1996-1999. In 1996, Apostle Reid founded Youth with a Fire Ministries (YWAF) in North and South Carolina and in 2005 he established Seated International Ministries, where he served as Senior Pastor. Apostle Reid served as Assistant Pastor of Grace Tabernacle Deliverance Ministries Inc. for 10 years. Apostle Reid launched OTR Ministries International in 2009 to consolidate his multiple resource networks. Prophet Reid has over 20 years of extensive ministerial experience. A native of Charlotte, North Carolina, Apostle Reid is happily married to Miatta Reid and a proud father. He is a graduate of Winston Salem State University with a BA/BS degree in History and Sociology. Apostle Reid obtained a Bachelors as well as a Master&#x2019;s Degree in Theology from Life Christian University. He is presently in pursuit of his Doctor of Ministry in Theology degree from Life Christian University. Apostle Reid has used God&#x2019;s blessings and favor upon his life in the marketplace, as Founder of ECKLESIA Professional Development Center in 2001 and Founder of M.I.N.D. Consulting firm in 2007, providing mental health and consulting services. He is also a seasoned Consultant, Trainer, Motivational Speaker, Writer, and Poet. His first book, DON&#x2019;T PRESS FAST FORWARD, was released in 2010. His next four widely anticipated books: Spiritual GPS, Your Ministry Is Not Impossible, Nine Keys To Keeping A Vision Fresh, and Words From The Low Place are due to be released in the near future. Using his God given passion to teach, Apostle Reid has developed a series of explosive empowerment workshops and conferences.